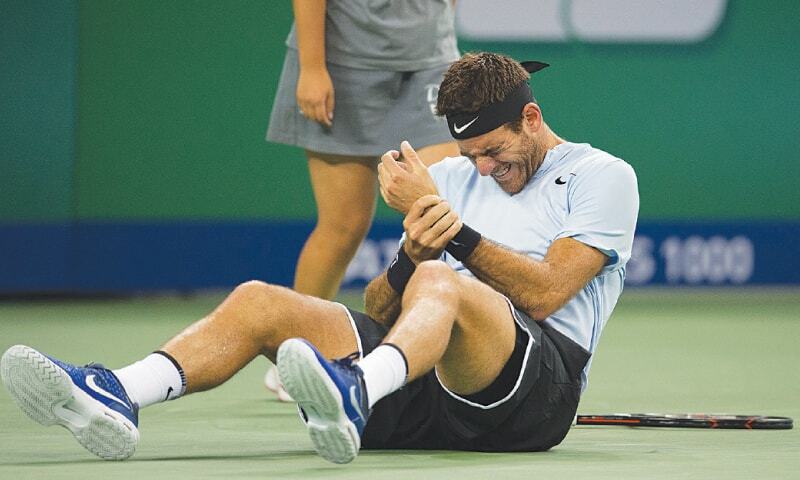 SHANGHAI: Juan Martin del Potro could be forced out of his Shanghai Masters semi-final on Saturday against Roger Federer after the Argentine suffered a wrist injury in an awkward fall on the court. In the other last-four showdown Rafael Nadal will play Marin Cilic after the red-hot world number one had to fight his way past Grigor Dimitrov 6-4, 6-7 (4-7), 6-3. Sixteenth seed Del Potro heroically clambered off the floor and from a set down to knock out Serbia’s Viktor Troicki 4-6, 6-1, 6-4. But it came at a high cost and he was due to see a doctor straight after the match to see the extent of the damage to his left wrist, which has been operated on three times before and in the past threatened to end his career. If the Argentine, 29, does miss out it will be just his latest injury heartbreak. “I felt something wrong in that moment but I continued to play with slices to try to finish the match, but now it’s time to see what the MRI [scan] and also what the doctor says,” Del Potro, the 2009 US Open champion, said. “I’m a little worried but I know to deal with all of these things as I have been through them in the past, but I will see what the doctor says now and then we will take a decision for tomorrow. Del Potro’s foot appeared to get stuck on the floor and he crumpled down, landing on his left hand and bending it painfully backwards. He needed several minutes of medical attention and sat on a chair at the back of the court, wincing in obvious distress. Incredibly, he broke the serve of the unseeded Troicki on his immediate return to action. Swiss legend Federer booked his spot as he eased to a 7-5, 6-4 victory over the unseeded Frenchman Richard Gasquet. Federer, the second seed, has not dropped a set all week. Nadal, who has never won the Shanghai Masters, is chasing a seventh title in a brilliant season and a hat-trick of triumphs on the trot, having been crowned US Open and China Open champion in recent weeks. The 16-time Grand Slam winner saw off the Bulgarian Dimitrov in Beijing last week but suffered some hairy moments in getting the better of him again in a nervy quarter-final played in overcast conditions. “Very happy, it was a very tough match, both of us played a very high level of tennis,” said the 31-year-old Spaniard, the top seed. “I enjoyed it, a great battle between two players that are playing all the time very focused and intense points. “A lot of matches in a row winning and very happy with everything, let’s see what happens tomorrow, but being able to win in Beijing and now semi-finals here… tough events against tough players. Nadal edged in front when he got the break of serve in the ninth game of the first set and there was nothing between him and his good friend Dimitrov as they entered a tense second-set tie-break. The Spaniard got the mini-break for a 3-0 lead in the tie-break, but sixth seed Dimitrov scrapped back to level and then stunned Nadal to clinch the tie-break. They headed into a deciding set with Dimitrov in the ascendancy and the pro-Nadal crowd fearing an upset. Dimitrov sensed another opportunity in the fifth game of the third set, but Nadal survived the breakpoint. Nadal took the momentum into the next game to immediately break Dimitrov and finally end the Bulgarian’s resolve. The Spaniard’s victory march was only momentarily held up when a disturbance broke out in the crowd and the players were forced to wait as a small group of spectators was escorted out of the arena. The Croatian fourth seed Cilic — who has defeated Nadal only once in five matches — beat unseeded Spaniard Albert Ramos-Vinolas 6-3, 6-4.